It's possible now to preorder the album! MUSE will be released on September 14th. So exciting, but I'm not sure which one to get, plus I know they'll release one with a DVD eventually as well so maybe I should wait for that..IDK. I'm so happy she has her own official youtube page too! Love the new song. I'm grateful for all the news you post too, it's very helpful, good job! MUSE of Dream, définitivement !! Well, when I type the Chinese name of the gift on Google Pics, I get this if that can help! Can't decide! Was thinking muse of love cos it looks like a hardcover book packaging and weighs 600g per yesasia (other is only 400g). Muse of dream has paris photobook though and better odds of getting photos of her in the gold outfit she was shot wearing there but no mention of number of pages...also that strange dog thing..
As for me my choice was quickly made, I couldn't possibly miss the Whoohoo thing, it's too awesome to be ignored lol And the Paris photobook as well. I'm so maaaad cuz I can't choose ! Both of these shoots look awesome so which one shoul I take lmaoooo !? I guess I'll wait for another version... The album cover looks so good too ! hello, hey you haven't add the site HMV for pre-orders, that's from where I order it. I didn't know about the rest except for yesasia (which I don't trust much anymore, have had some bad experiences) so i was happy when I learn HMV was selling jolin's stuff. It was sold out the last time I checked! Thank you!! No worries. 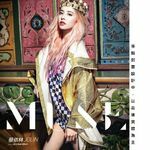 Thanks for all the good work you do keeping us Jolin fans updated with all her activities via this website!